"Doris Jeanette has dared to live at her edges, fall off the map of her known world, and come back with the means to tame monsters." Dr. Jean Houston, mother of the human potential movement. Doris Jeanette was a licensed psychologist for 40 years. Now, she is a writer, human energy teacher and vibrant life coach. Her goal with everything she does is to give you a clear pathway to holistic health and vibrancy. If you have a creative project, need a transformational teacher or would like to set up a Nature Workshop email her. Dr. Jeanette is author of "HOW TO HEAL A BROKEN HEART AND STOP THE HURT: Mend Your Relationship Heartache With Self-Love," available at Amazon. 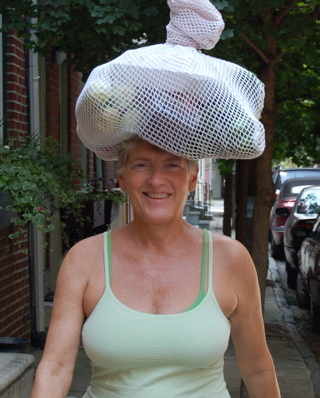 Here is Doris in the summer time, carrying her heavy groceries, efficiently on top of her head in Center City, Philadelphia. This method, used for centuries by women, is being studied by aerospace engineers. Doris knows the scientific secret: Remove the anxiety from your body and viola'! Even in the winter time Doris likes to stand on one foot while balancing her groceries on top of her head. This image was used as the cover for her best selling audio series, "Opening the Heart." The late Dr. Elisabeth Kubler-Ross loved "Opening the Heart." Doris Jeanette was proclaimed "The Siren of Spontaneity" by the Philadelphia Inquirer in 1994. Maralyn Lois Pollack, who wrote the featured interview in the Sunday Philadelphia Inquirer also reported that she was "warm, genuinely likable" and communicated in "honeyed tones of her muted Southern accent." "Ever so incrementally, Doris Jeanette (nee Ward, formerly Keller) has expanded, and exploded, the boundaries of her traditional clinical training. She holds a doctorate in psychology from highly respectable Baylor University, and she had a post doctoral fellowship with eminent behaviorist Joseph Wolpe, M.D. at Tempe Medical Schools, both during the 1970's. ...With Nature as her co-therapist, Doris Jeanette's outdoor workshops at the seashore or forest bring participants back, she says, 'to sanity, health, and freedom." Click here to go directly to Dr. Jeanette's professional vita. Doris Jeanette has also been known as Dr. Doris J. Keller, Doris Jeanette Keller, Doris Keller, Doris Ward, Doris Jeanette Ward, Doris J. Ward. The New Psychology is safe, effective and holistic. The New Psychology is dramatically different from current managed care, talk therapy. Click to read the definition of the new, holistic, alternative psychology. You can learn how to carry heavy objects on your head and balance on one foot! 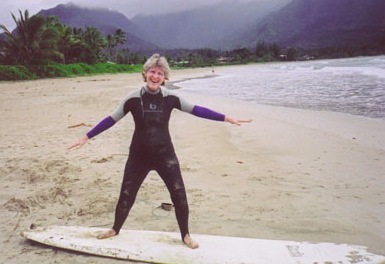 Or learn to surf at the age of 53! Read about the purpose, history and mission of the Center for New Psychology. The Center for New Psychology has a global vision and respect for all cultures. This about Dr. Jeanette page contains information about Dr. Doris Jeanette and the Center for New Psychology. She has also been known as Dr. Doris J. Keller, Dr. Doris Keller, Doris Jeanette Ward, Doris Ward, and Doris J. Ward.